Examining the ups and downs of Garmin’s revolutionary retrofit autopilot system. The autopilot controller is a standard-width instrument that can go into the center stack of your avionics bay. The controls are identical to many G1000 installations, though the VNAV feature is only active when the system is paired with a Garmin navigator with vertical nav capability. Over the past couple of decades and change, I’ve flown behind a staggering variety of autopilots, from the always-active Mooney positive control, single-axis “wing-leveler” model to the remarkably sophisticated autoflight system in the Boeing 777, which will autoland the airplane in conditions too low for a human pilot to see to even taxi back to the gate. And over all this time, there’s been one constant: You get what you pay for. The more advanced the features, the better the performance, the bigger the airplane, the more you paid. With the exception of big bizjet and airliner systems being very expensive, the old adage is true no more. The GFC 500 is an autopilot that gives you a staggeringly sophisticated level of capability for a price, $6,995, that looks like it has to be missing a digit. It’s not. There’s just no way this product should be able to do what it does for what it costs. But, again, it does. We’ll get to precisely what it does in a minute, but first, a little history. When Garmin introduced the GFC 700 integrated autopilot with its G1000 integrated avionics suite more than 10 years ago, it was a revelation, a digital attitude-based autopilot with altitude hold and preselect, vertical speed, indicated airspeed hold (a.k.a., flight level change), heading mode, nav mode, approach mode, turn anticipation and more. And this was all as part of a flat-panel avionics suite that came in airplanes from Cessna Skyhawks to Cessna Mustang jets. The secret that allowed such variety of applications (and there were many more on the way) was the use of what Garmin calls “Smart Servos,” which, instead of dumbly obeying the controller’s demands, are set up to behave to suit that particular airplane model’s characteristics. There are a few different classes of servos that Garmin makes to suit the class of airplane—jets need beefier and more environmentally hardened models than Mooneys do, for instance. But the concept remains the same. And the performance of the GFC 700 was nothing short of spectacular. Its superhumanly smooth capturing of the localizer or satiny leveling off at the preselected altitude made us mere human pilots magenta with envy. For decades, the most popular autopilots in light GA were those made by STEC, and they were and are popular for a few very good reasons and were revolutionary in their own right. Unlike more sophisticated and far more costly autopilots of their day, the STEC models based their commands on rate of turn information from the turn coordinator rather than from an attitude gyro. In early Cirrus aircraft, there’s actually a turn coordinator hidden inside the panel, just to drive the autopilot. (It doesn’t need to be hidden, of course.) The upside was that these rate-based autopilots were far less expensive for companies to produce, they required far less expensive companion instruments, and they were a lot easier for those companies to certify, too, because they presented less risk than attitude-based units. They were also less capable, their performance was less accurate and errors were larger and more common, and they could be challenged by rough air. It was common for pilots flying an approach with a rate-based autopilot—they are still very common—to watch the autoflight system fly a series of shallow S-turns trying to capture the localizer. At the same time, they had another really great advantage. They would keep on working even when your vacuum pump or attitude gyro went kaput. I once had an attitude indictor fail on departure from OSH after an airshow about a dozen years ago. The plane was outfitted with an S-TEC autopilot, and whereas an attitude-based autopilot would have likely attempted to follow the false information the failing gyro was feeding it, the STEC proceeded to do absolutely nothing different than it had been doing before, which is, holding a heading while we climbed. It was such a non-emergency I even whipped out my camera phone and snapped a pic of it. I should mention that we had a standby, electric attitude indicator in the panel, too. The GFC 500 is married to Garmin’s G5 primary attitude instrument. The G5, as you probably know, is Garmin’s remarkably successful, affordable, solid-state avionics solution for lower-cost used GA planes, which, because of their lower value, have previously been orphaned in the avionics retrofit revolution. Make no mistake. These lower-cost, well-loved planes can benefit greatly from the update. It can be done for very little out of pocket, too. In fact, if you want a sub-$10,000 autopilot upgrade, you could pair a G5 and the GFC 500, and you’d be all set. You don’t get the same kind of capability as with a more extensive upgrade, but you get solid-state attitude and a full-function autopilot. For less than $10K! That’s nothing short of revolutionary. You get new servos as part of that package, too, and a mode controller, which you use, just like it sounds, to select the mode of operation for the autopilot, i.e.…nav or heading, vertical speed or indicated airspeed climb, etc. Most owners will add at least a navigator to that package and often an additional G5, as well. One G5 is the attitude indicator and the other the directional gyro/HSI. The system will pair nicely with a GNS-430W or 530W, but the more modern GTN 650 is a great match and a popular choice, says Garmin. The larger, even more capable GTN 750 is a good match as well, and some pilots will add all of the above. The package with two G5s (one with an accompanying data bus), a GTN 650 and the two servos (one for pitch and one for roll) would come in at just under $25,000, a remarkable price for a glass panel-like experience with a pair of digital displays, a digital autopilot mode controller, a digital autopilot and a top-of-the-line navigator. There are some downsides to the system. You can’t get a GFC 500 without the G5. The G5 contains the brains of the autopilot and is also the source of the attitude that drives it. Lose the G5, and you lose the autopilot—that is, unless you have a second G5 installed, in which case the GFC 500 will revert to using that display’s output. In fact, with two G5s installed, the reversionary logic works very much as it does with the G1000/NXi and their GFC 700 autopilots. If you just have one G5 and if you lose that functionality, you get an unmistakable flag that lets you know you’ve lost your autopilot. If for some reason the G5’s attitude data is valid but outside of acceptable limits, it can realign itself, either in taxi or in level flight, which is exactly how it works with the G1000 as well. I went flying with Garmin Senior Aviation Media Relations Specialist Jessica Koss in Olathe, Kansas, recently so I could try out the system. Our wings for the sunny early summer day was a vintage Cessna Skyhawk—in other words, the exact kind of plane that such installations are intended to go into that are, in fact, going into in big numbers. As our luck would have it, the air conditioning was broken on the 172, well, in the sense that there never was air conditioning in it, so we wanted to get airborne as quickly as possible to see the GFC 500 do its thing. When it came to the weather, we were in real luck, and once we got to pattern altitude, the air turned smooth as elevator jazz, inviting us to put the GFC 500 through its paces. Now, our 172 Skyhawk was outfitted with the ideal Skyhawk package I described above: a pair of G5s, an attitude indicator and an HSI (with the GAD 29B adapter). Also installed were the GMC 507 autopilot mode controller, the GSA 28 servos and a GTN 650 (some photos will show an alternate installation with the GTN 750). Before I start getting into the autopilot, let me weigh in on the G5. This little solid-state attitude indicator and/or directional “gyro” is a piece of art. Its architecture and user interface design both leverage Garmin’s long experience in building avionics that are found in some pretty amazing business jets. A pair of G5s, as shown, is a potent combination. It might not be a flat-panel suite, but when paired with the GTN 650 or 750, it gives the pilot a huge percentage of the capabilities of a G1000 system. Now, one feature of the autopilot I haven’t mentioned yet is ESP, which stands for “Electronic Stability and Protection.” It’s what’s known as “envelope protection,” an advanced autoflight capability that keeps pilots protected, mostly from their own mistakes, though, I should add, we all make mistakes. ESP has a number of functions, and it’s hard to say which is most important. I guess it depends on what mistake you just made. The function that gets you out of that jam is the most important one, clearly. So we tried them all out. After takeoff, I engaged the autopilot, which you do exactly as you do with the GFC 700, though the controller might look a little different than the one you’ve used in other planes. The buttons and functions are the same. The early answer to my question was, yes, I couldn’t tell the difference between the integrated GFC 700 in G1000 suites and the GFC 500 retrofit system in the Skyhawk we were flying. We used both heading and nav mode, altitude hold and altitude-capture, vertical speed climbs and indicated airspeed climbs, as well as vertical navigation as integrated with the GTN 750 navigator. In ESP mode, which is always on and transparent to the pilot until it activates, we first tried out the overbank protection, which prevents the pilot from inadvertently putting the plane into too steep a bank, which ESP constantly monitors but only begins to put correcting counter-pressure to the ailerons after the bank gets to 45 degrees. After that, the counteraction gets stronger until it’s at its maximum at around 70 degrees of bank. The protection can be manually disabled for training purposes. We also looked at the underspeed protection, which bumps the nose up or down to keep you from stalling or overspeeding the aircraft. When paired with a compatible navigator, the GFC 500 will fly fully coupled approaches, including (quite remarkably) coupled missed approaches, which is a skill that even many experienced instrument pilots can get rusty at. And all the while, you have the backup of the ESP, so if you, for example, forget to add in the power as you raise the nose, the system will lower the nose back down to maintain flying speed (and then a small margin on top of that). So how does the GFC 500 stack up? Well, for my money, the package deal of a G5 and a GFC 500 are impossible to beat for bang for the buck for pilots who use their older planes for regular transportation, whether or not they fly under IFR flight plans regularly; in fact, whether or not they’re even instrument rated. 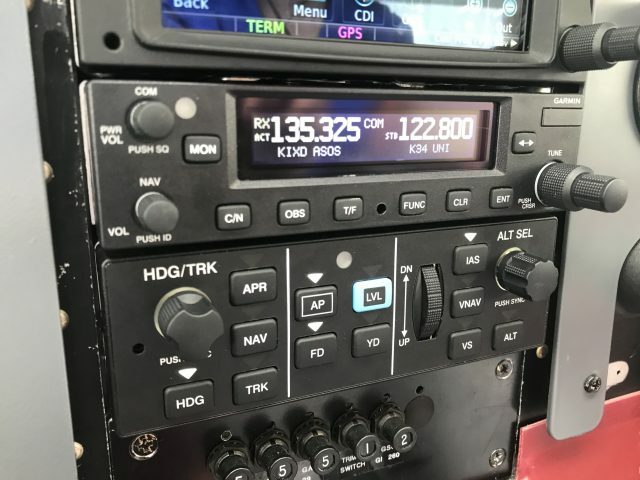 For around $10,000 for the hardware—installation rates vary greatly from shop to shop and plane to plane—you can get a full-featured digital autopilot and digital attitude indicator with built-in ADAHRS, which is not just two improvements but several, as you get a great display, digital flight guidance, envelope protection and solid-state attitude and heading. Garmin wouldn’t give me a figure for the number of G5s it has sold since the instrument was introduced last year, but as they weren’t telling me, their eyes were smiling. The number is a big one, and the shops I spoke with on the subject say they’re installing lots of G5s, many of them with the GFC 500 and a navigator as part of the package. The GFC 500 is approved for installation in a number of Cessna, Beechcraft and Piper aircraft, including a number of Bonanzas, dozens of models of the Cessna 172 Skyhawk and 182 Skylane and the Grumman American Cheetah and Tiger, among others. The company is already working on additional STCs for several models of Cessna 210, the Beech Debonair, and the Mooney M20. For all of these older platforms, the cost of upgrading to digital displays and a digital autopilot has long been too steep to easily justify easily. With the arrival of the G5 and GFC 500, that is no longer the case. There are other autopilots and retrofit flat-panel avionics products appearing on scene, including intriguing products from Dynon and Genesys with its STEC line of autopilots. Look for additional flight reports in coming issues.